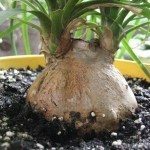 Why has the growing tip of ponytail palm died? This plant is about 30 years old and has grown steadily until this summer. I moved it from a bright location to a dim location - and probably started watering on a more regular basis. So I suspect rot. At least two dozen of the leaves at the tip became yellow where they attached and are very flimsy. When I noticed this (probably weeks to months after it began), I was able to slip those leaves off the plant, leaving greenery below and a bare growing tip that is not growing. It is also not drying up. I just noticed that a pup is growing just below the live layer of leaves. Is there any hope for the growing tip? If root rot has set in it is likely to kill the Ponytail Palm. You may be able to propagate the pup.